The theme Green is amorphous and has come about as a strategy to contain a range of specific moments in the present we are thinking about: springtime, the election and our part-time working lives on farmers market stalls where kale is snapped up like there is no tomorrow. We want to consider our relationships to these events and we have invited artists to use Green as a starting point, they will be exploring various themes including wildness, public/private space and commerce. 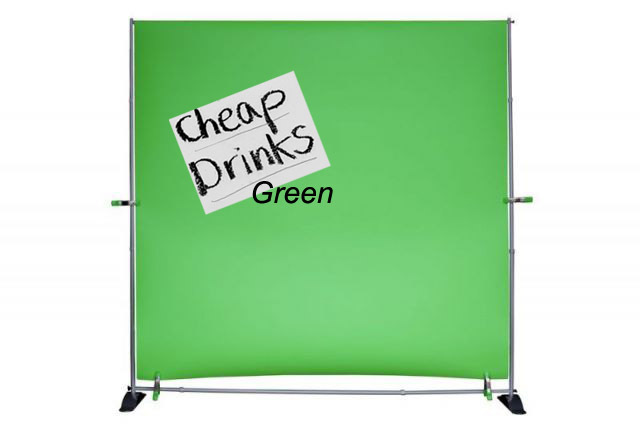 Some artists have used green as a green screen for their own theme. Cheap Drinks is a two-year-old art event that stands for a loose frame with an easy ability to adapt to different contexts. We indulge in the space we have made to practice and test things out. The exhibition series began in my living room in Autumn 2012. Since then we have felt the desire to experiment with the context in which Cheap Drinks happens. We have held events in pubs, invite only spaces, publication formats and artist studios. Operating under a BYOA (bring your own art) policy, audiences and artists from all disciplines are invited to exhibit, curate, perform and view artworks. Cheap Drinks, The Book is an exhibition in the form of a publication. The Book is on sale at varies bookshops across London, including Tender Books, Banner Repeater and Jackson's Art. Cheap Drinks, The Book is available for £5, please contact me for more details of purchase.